For the past three seasons, high-speed player-tracking cameras have been logging every possession of every NBA game; over that same time, NBA.com has hosted some cool observational stuff — like how far players run in a game, how often they drive the lane or spot up and, most important, how often they are passed the basketball. Now, ESPN has gotten its hands on advanced tools to analyze the game’s nuances, stats that can measure things like how difficult a given shot was or how often a given defender is torched off the dribble. We’ll be using them throughout the playoffs, but I figured we may as well slap a few of them on some charts to establish a baseline (and, hopefully, to confirm a few petty biases along the way). On our maiden voyage, we’ll take a look at which players make shots they have no business making and which miss the ones they have just as little business missing. 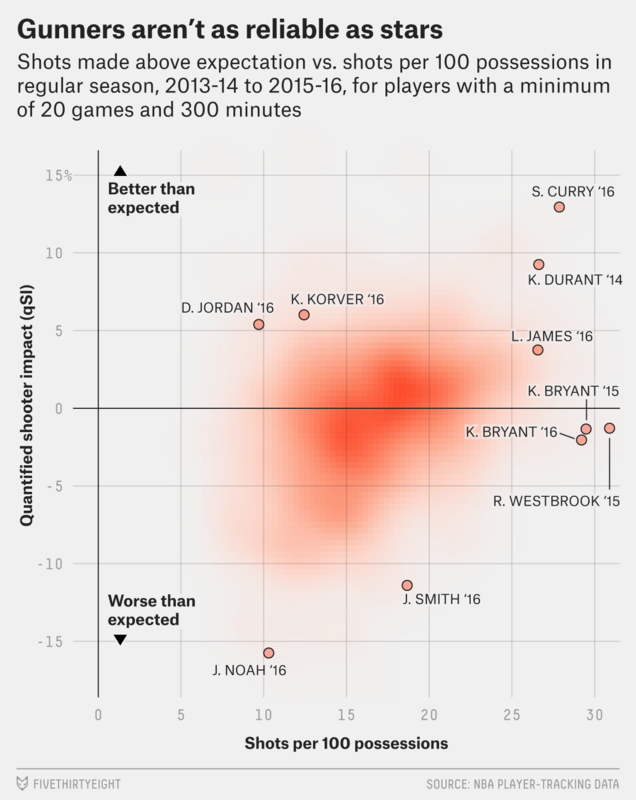 For all these charts, we’re looking at players who logged at least 300 minutes across at least 20 games — rotation players in a quarter of the season, basically. You’ll also notice that we’re using effective field goal percentage (which weights 3-point attempts more than 2-point attempts), not true shooting percentage (which does the same but also factors in any free throws a player shoots), so we’re losing the effect of getting fouled, which is a big deal! But given the relative infancy of these stats, this is what we have. If you must, keep a running tally in your head of which players put themselves in position to really need to pile up foul shots to boost their efficiency and then go check where they stand afterward. Here’s a head start: In 2014-15, Russell Westbrook had a free throw rate of .445 (meaning he took .445 free throws for every field goal attempt); in 2013-14, Kevin Durant’s was .477; this season, Kobe Bryant had a free throw rate of .252 — the lowest of his career. Anyway, to the charts. This looks a lot like charts we’ve run in the past, or those that have run elsewhere, that plot workload against efficiency. True shooting percentage against usage percentage, for example, looks more or less identical. As workload increases, easy shots are harder to come by; as it decreases, players can pick their spots more carefully. Roll call: That cluster of dots in the top left of the chart is Tyson Chandler and DeAndre Jordan wrestling back and forth for the title of Guy Who Only Does Dunks. 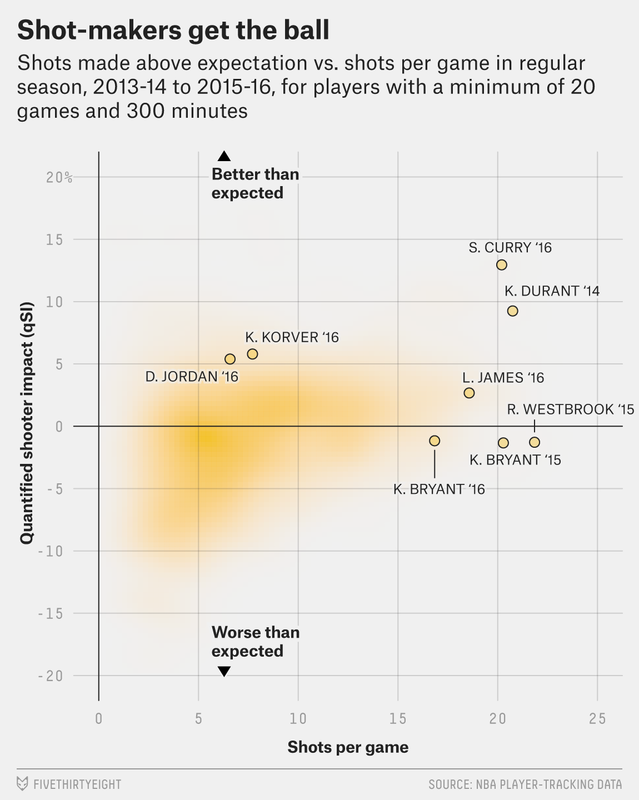 In the upper portion of the high-workload guys (on the right), we see players like LeBron James and Stephen Curry this season — those on great offensive teams that can space the floor for pretty good looks even for their highest-usage players. A little further down, still in the high-usage region, we see guys on teams that often need their stars to carry them, like Westbrook last season or Durant two seasons ago, or Carmelo Anthony, DeMar DeRozan or past iterations of LaMarcus Aldridge. Kobe this season was in the lurch, though by this measure not quite as depressing as his truncated 2014-15. In this chart, players’ positions above and below the line for 0 represents how good or bad they were at making shots relative to how difficult the shots were. 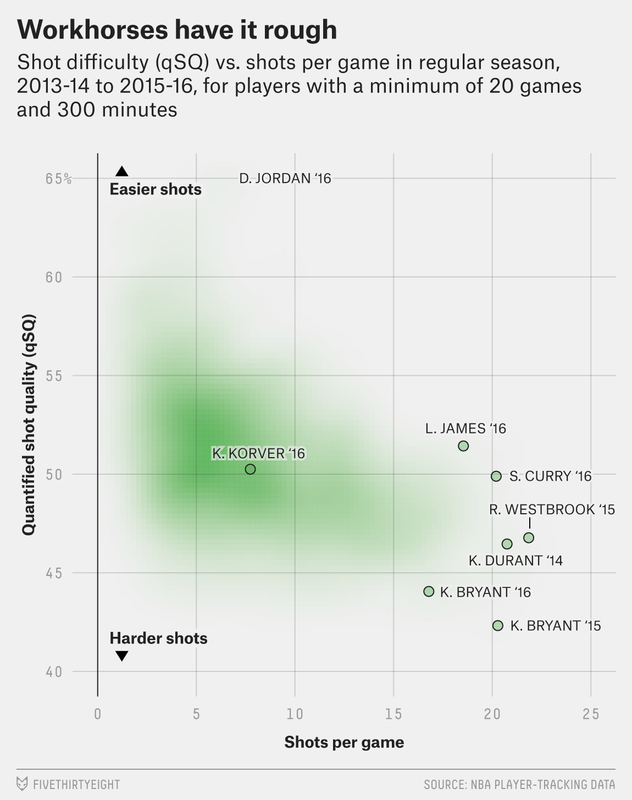 On the whole, what we see here is that as a player’s shots per game increase (we’re leaving per-play numbers for later), there’s a greater likelihood that he is good at making tough shots. This is conventional wisdom — stars get the ball — but not something we’ve been able to observe directly before. Remember that line about KD, Russ and Kobe’s free throw rates? Here’s where it comes back into play. Durant and Westbrook both had high free throw rates in their seasons on the chart, so they’d both get a boost from their positions here — Durant’s free throw rate in his MVP season was even higher than Westbrook’s, so it’s not like 2014-15 Russ catches up in efficiency. But eyeballing is enough to conclude that he would probably move up if we included free throws, and grandpa Kobe would stay in the toilet. Last thing: Notice that DeAndre, who was off the charts in shot quality this season, falls some here but is also well above average versus expectation on those good shots, evidence that he isn’t simply spoon-fed easy looks from Chris Paul but is among the best finishers in the game; this is tanked somewhat by his absurd 1.219 free throw rate, which has climbed to 1.553 in the playoffs (last season, it was 1.938 in the postseason — meaning that Jordan took just about two free throws for every field goal attempt). This chart mostly serves to show that the relationship we showed you in that first chart holds true when we look at per-possession. We also see guys who don’t take a lot of raw shots, like Marreese Speights, bunch up with gunners who play more minutes. But since we’ve already gone over low usage and carefully selected shots and all that, this seems like a good place to tell you that over our three seasons of data, last season’s vintage of Kobe Bryant picked his spots least carefully of any player in the data set. If you compare this chart to the yellow one above, our nicely defined trend of good shooters getting the rock has loosened considerably. It’s probably safe to assume this happens because the profile of a bench player who comes in and shoots the leather off the ball for 20 minutes a night is very different from a guy who’s asked to keep up that rate for an entire game. It’s probably a mistake to make a bunch of sweeping conclusions based on the aggregate here, as it is with most stats. 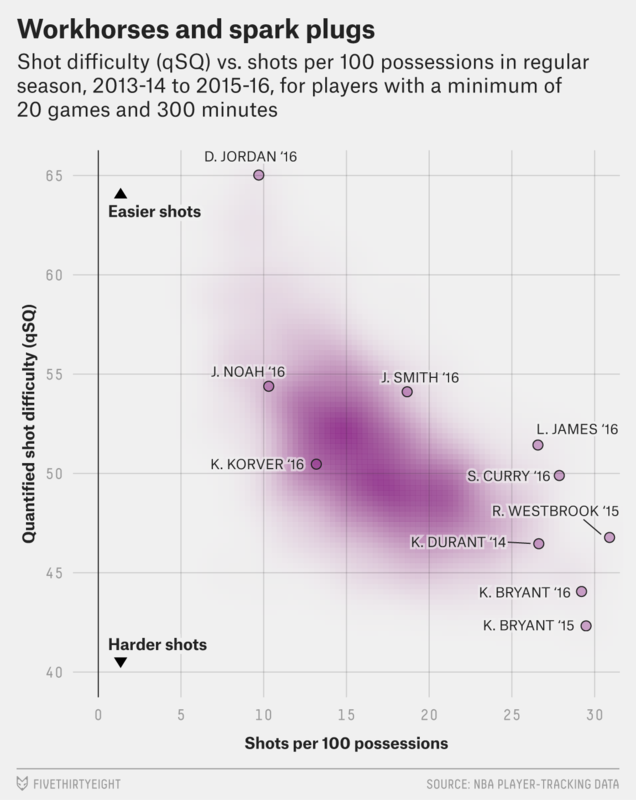 But in an era of analysis in which “volume scorer” is still a pejorative, it’s notable that the players who shoot the most are also typically the best at converting tough shots, unless they are 37 years old and Kobe Bryant.